The King Edward VII Sailors` Rest was erected to commemorate King Edward VII. 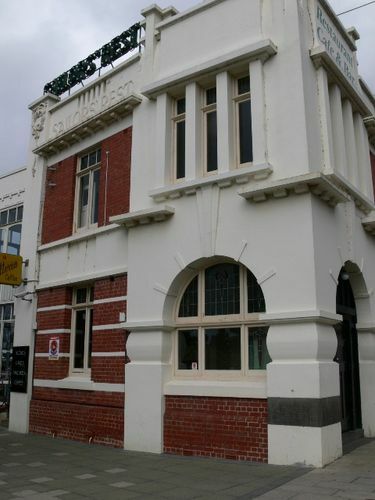 This two storey brick and cement rendered Edwardian period structure was designed by architects Seeley, King and Everett, the design being attributed to Percy Everett and was notable for the nautical art nouveau ornamentation and use of reinforced concrete in a raft floor slab. Completed in 1913, Sailors’ Rest provided company and entertainment for sailors whom had spent weeks, and often months at sea in the confines of sailing ships. In fact Sailors’ Rest served as a home away from home for seafarers until 1986. In the glaring heat of Saturday afternoon, the State Premier, Mr J. Murray, laid the foundation stone of the King Edward Memorial Sailors’ Rest in Moorabool street. It will be a handsome two-story building, to cost £1600, towards which £1100 has been subscribed. A guard of honor from the training ship John Murray attended, and the Premier paid a fitting tribute to the hard-working Jack Tar. Ballarat Star (Vic), 5 February 1912. Note : The building is now a restaurant.